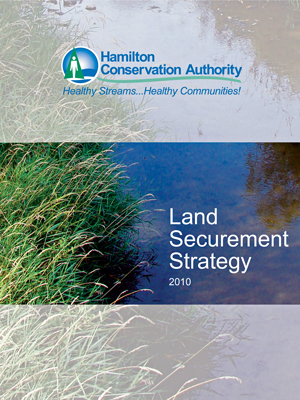 In 2009, Orland Conservation developed a Land Securement Strategy for the Hamilton Conservation Authority to assist with the identification and application of strategic goals and implementation guidelines for acquisition of natural land in the Hamilton watershed. The strategy applies a methodology for identifying candidate sites for land donations, conservation easements, and effective techniques for engaging landowners. Part of the strategy includes educating the public about HCA’s work and long-term conservation vision. To assist with this communications component, we recently designed and produced two educational brochures that highlight the strategy and ways for conservation-minded landowners in the Hamilton area to get involved in land conservation. The brochures were printed by PrintNG in Toronto on 100% recycled post-consumer paper made in Canada.